friends use. What should they follow and what should they not? It can be difficult to navigate with so much different advice flying around. As a pediatric OT that specializes in feeding, I want to throw my two cents into the pot and share with you the yea’s, nay’s, and maybe’s. My hope is that parents or caregivers can have feedback on these popular rules if they aren’t sure what direction to go in or if what they are doing isn’t working. Moreover, if your child is a problem feeder or a picky eater than some of these rules may actually do more harm than good. Unfortunately, parents of these kiddos are often desperately looking for advice (understandably so) and lots of friends and family dispense what works for their kids, which adds a lot of pressure to stressed parents. I really want to eliminate that! With that being said, I’m not going to address all of the manner type rules (i.e. put your napkin in your lap, chew with your mouth closed, etc. ), unless I think they could negatively impact eating. I will also not be sharing all of MY basic mealtime rules. If you are interested in that you can click here or under Eating Basics in the menu bar. Let’s get started! For each “rule”, I’ll be giving a rating of Yea, Nay, or Maybe and of course a full explanation of why I feel that way from a feeding therapist and mom perspective. One quick disclaimer, I know some of you may have already implemented one or more of the “rules” that I may be “naying”. Please know that I respect your parenting choices and I realize that it may work for your family. In that case, I support what you are doing, but please understand that it may not work for someone else. I encourage productive and constructive comments about the rules your family uses. 1. Eat what is in front of you (and no other food until you do). Nay – I think most parents know in there gut that this isn’t the way to go, but many parents with picky eaters often end up resorting to this at one time or another. The obvious logic is that if you only offer your child new or non-preferred food they will eventually be hungry and eat it, BUT this often backfires. Research actually shows that a small percentage of kids will actually go hungry. I can’t tell you how many homes I’ve been in or consultations have shared with me that they tried this at a doctor’s advice only to have their child become quite ill and their eating get even worse. 2. No dessert (TV, electronics, etc.) until you finish (all or some predetermined amount of) your food. Nay – When I was growing up this was our family rule and was common in most homes. Now that several generations have grown into adults with unhealthy eating habits, health experts now believe that using food as a reward is fundamentally detrimental to our relationship with food. Think about it, most of us (me included) look to food when we are down or to pat ourselves on the back when we did a good job. You know what I’m talking about, you got some recognition at work so you treat yourself to ice-cream or you had a really bad day so you hunt down a piece of cake. It fills a void because we were constantly rewarded with sugary treats. Moreover, we are teaching our kids that the veggies/meat really aren’t that good, but just something we have to do to get to the dessert. I really want to teach my kids to enjoy a variety of food not just the goodies. I know some of you may be thinking… “I don’t care, if it gets the veggies/meat in their mouth,” but it just doesn’t work for some kids with difficulty eating and then you are left jumping through hoops anyways. I will say that some feeding therapist use food rewards as a strategy to make progress with kids at times, but most would agree that they fade these dessert rewards out. 3. Take a polite bite/Try a bite for each year of age. Maybe – I have to admit I hadn’t heard of this rule until I started blogging. When I scroll through my main page on Pinterest I will occasionally see an article written by a mommy blogger about picky eating. Of course, I click through to see if I can share it as a resource. Almost every time I do I see this rule listed among their strategies and I cringe a bit. Please know I’m not trying to put anyone down here, but I do have some reservations about this rule. As I said above, it’s fine if it works for your family, which is why I gave it a “maybe”. 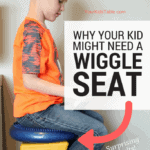 Again, for kids with eating difficulties, this is just setting the bar way to high and can put a lot of stress on a kid with sensory processing and/or chewing difficulties. So many of the parents I work with have tried this just to have meals end in total meltdowns because it is too much for them. The parents feel defeated and don’t understand how it could possibly work for their friends kids. I do like that it gets some kids tasting and trying foods, as well as teaching them to be respectful, but it isn’t a one-size-fits all kind of rule. Nay – It is true that toddlers prefer to graze on food because they don’t want to sit long enough to eat, but for many kids this is a slippery slope that leads to really poor eating habits. In addition, some kids won’t consume enough calories throughout the day. I know this is temptingly easy and a particular doctor has recommended it in his books, but if you can, you are better off avoiding it and putting the work in up front to develop good eating habits like sitting at a table and regular meal times. 5. I decide what goes on the plate and my child decides what they eat. Yea – Ding, Ding, Ding, we have a winner!!! I know this is easier said than done because it requires us to relinquish some control. It is our job to set up the what, when, and where they eat, which is enormously important and can have a huge impact on the eater’s our kids ultimately become. It is our child’s job to decide how much they eat. I am not saying that means you don’t work at getting your child to eat new foods or that there will be meals where your child doesn’t eat enough. However, if you set up a positive environment where they can feel comfortable exploring new foods and they know they only have to eat until their stomach is full, then you can expect to raise a child with a healthy relationship with food. 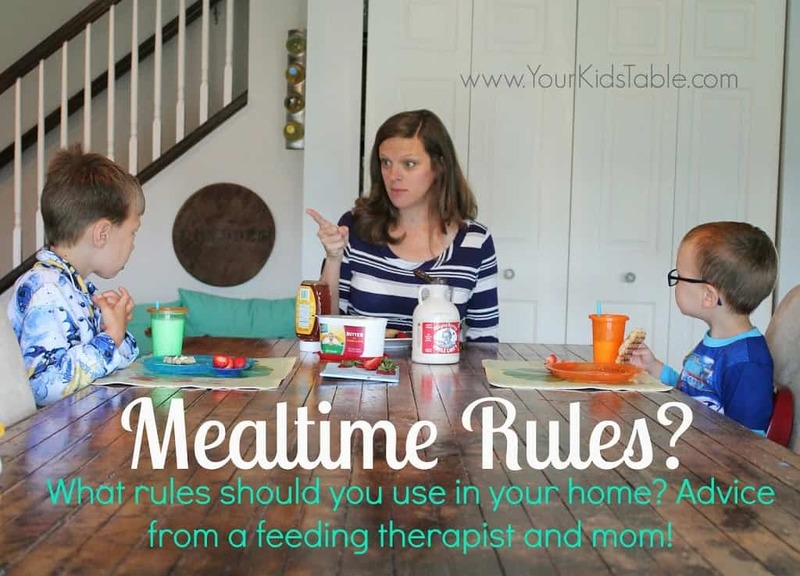 With this rule it is important to have structured mealtimes that are spaced 2.5-3 hours apart. If your child says their belly is full after only a few bites, make sure they understand that they won’t be eating again until the next meal and follow through on it. By two and a half kids are capable of understanding this, for younger kids do your best to hold to it, but exceptions need might need to be made. Thanks to input from the facebook fans who provided some great insight on how they use this rule in their home. If you want to read more about getting your kid to try a new or non-preferred food click here. 6. No special or individual meals. Yea – Serving everyone the same food is important because it shows kids that you are eating together as a family and it doesn’t promote picky eating. Although the way we cook and what we serve undoubtedly changes when we have kids, there should be an equal compromise. Meaning, you aren’t going to serve sushi or steak salad with your 20 month old and expect them to manage that, but in the same turn you don’t need to rotate between mac n’ cheese and spaghetti o’s every other night either. If your child is a problem feeder and you are already stuck making them separate meals, then slowly start to have them put something new on their plate from what everybody else is eating. Also, put some of what they are eating on your plate, too! 7. No negative talk about food at the table. Yea – This goes for adults too! Try to get in the habit of talking neutrally about food even if you don’t like it and encourage this same behavior from your kids. I tell my kids when they say something like “that smells stinky,” that we don’t talk about food that way. Instead of the negative comments, encourage kids to describe the food, such as, that has a really strong/salty/tart taste to it. 8. Sit at the table until everyone is done. Maybe – I totally get this from a manners stand point and for most older children this is completely appropriate, but I think for younger kids it can be a lot to ask. Depending on the child and what their limit is, start by slowly building up the time. For instance, if your 2 year old melts down after 5 minutes, then aim to keep him there just for 7 minutes initially. I wouldn’t recommend making any child sit longer than 30 minutes total. 9. Sit at the table for all meals. Yea – First of all, this is just the safest way to eat, so many kids choke on foods accidentally even when they are older. Just as important though is that we teach our kids that eating is an important part of the day that is structured and a regular part of the routine. Sitting at the table allows kids to focus on their eating and explore new foods. This is much more difficult to do on the go or on the couch. Of course, there are special exceptions when this rule can be broken, but it shouldn’t be a habit. If I missed any “rule” that you were wondering about than please leave a comment and I will share my thoughts! If you have a problem feeder/picky eater and want more help click here, here, and here. Or, if you are a new parent and are looking for more advice on setting up healthy eating habits click here and here. I’m also available for consultations via skype, phone, and email for individualized and specialized strategies. Hmm, it’s hard to say exactly what’s going on, there’s some clues pointing to oral motor skills… but there are strategies that can be done. This is one post that I think will be helpful, it’s about exploring new foods. But, I’m also in the middle of my picky eating challenge right now and that will give you some of the foundational strategies that are necessary for building on the more advanced ones! You can get a spot in the challenge here, I think it will be really helpful! There are a lot of picky eating strategies out there, and this is one I don’t personally agree with. I would make sure to offer one preferred food with each meal though. Hi there, my nearly 4 year old use to eat so well. Such a big change now as he is so picky and now going off more food. He won’t eat anything like mash, Shepard’s pie, spaghetti bolognese.. or any homely dinners also as soon as he sits at the table he says he doesn’t want it. He says the mash will make him sick and I think he maybe referring back to a long time ago when he was sick at dinner. I still put a little of what we have on his plate knowing he won’t touch it but it’s also along side something I know he would eat if he did. Many times iv told him to wait until we have all finished at the table , then when we have he is aloud down but if he is hungry later I give him the dinner for him to have. Now I really would love for him to eat what we all eat as my nearly 2 year old eats very well (for now maybe), also to eat at the same time as us. I know this is really frustrating! It is pretty typical for this age to lose some foods. I think my free picky eating workshop will offer you some tips that will help. Ok…I need help. My daughter is almost 3 and meal times is a great source of anxiety and stress for my husband and myself. Our struggle is, that no matter what we put out, even if she picks it out and I know we really need to work on not being the short order cook part, she will not eat it. We can be sitting at the table for an hour or more and she won’t eat. I read on another blog to set a timer and then when it goes off the food gets taken away if there is anything left on the plate. So we have tried this tactic and it is proving not effective mostly because of the whole pressuring to eat, which I get now. She screams and cries if we take her plate of uneaten food away, but yet she sits there for 30″ and just talks and plays with her food. But if we even elude to the idea that she must be done eating then she gets upset and wants to eat. But she may eat only 1 bite and then we are back to just sitting there doing everything possible except eating. So is putting a time limit on eating time a way to go? We can’t sit there with her and talk about eating for over an hour. If we excuse her from the table but continues to claim that she is hungry do we allow more food to be eaten even after the dinner has been cleaned up? Feeding times has been a constant issue with our oldest and after 2.5 years we are getting tired, frustrated and she is getting the same with us. Anymore advice that could be offered would be great. I have loved reading so far what I have seen and we will begin slowly implementing a lot of your concepts and tx ideas into practice. I don’t want to overwhlem her at first, but I think our first big step is the no pressure eating. Which I want it to be that way but that’s my biggest problem is how long do we let her sit there and not eat because as soon as we say dinner is over she “flips” and wants her food but then continues to sit and not eat? Emily, this is a great question- so glad you asked because this will be an important point for you. Meals do need to be around 1/2 hour. You can approach this two different ways. First, and this will be the least stressful, begin by not letting meals go past 50 minutes for a few days, then 40 minutes for a few days or up to a week, and then 30 minutes. If it were me I would give lots of warnings to her and consider setting a timer, giving reminders as the end of the meal is approaching. She may cry, she may tantrum. That is okay, let her have her tantrum and divert her to something else. When you are giving her the warnings, make sure you tell her, if you don’t eat anything now you won’t be eating until the next meal. You will have to follow through on that, and that can be challenging. With your consistency she’ll know what you mean in a few days or weeks. Also, I wouldn’t ask her what she wants to eat. You choose making sure she has one preferred food. Check out the start here guides in the menu bar, they should be really helpful! I’m so happy I found this site! I have read similar things on the internet about food rules, but this is the first time I’ve heard anyone mention 2.5-3 hr. between meals, which is something that I think would totally help me with my ultra-picky 4 yr. old. As well as the one-preferred-food per meal. Wonderful advice! But I have a couple of questions: In regards to rule #2 when it comes to dessert: We don’t eat dessert a lot, maybe once a week or so on average. So, you’re saying if my child doesn’t eat dinner I should still let him eat that piece of chocolate cake/cookies/ or whatever it is the rest of us are eating? That’s a tough one for me to grasp. And regarding preferred foods; should I allow my child to just fill up on that one food if he refuses to eat the other foods on his plate? In that case, my son would probably eat nothing but carbs at every meal! Or, should I tell him he needs to eat the other foods on his plate before he has seconds of his preferred food? *sigh*…. It’s been difficult for me to enforce any type of rules in regards to eating in our house because my husband isn’t totally on board with me. He feels that I’m “starving” the kids if I don’t give them their preferred foods whenever they don’t want what’s on the table. He’s a very picky eater himself, so I believe some of the negativity towards food may be influenced by him, unfortunately. As for preferred foods, serve an appropriate portion of everything, or smaller sizes on non-preferred. Again, you will want to choose your words when they ask for more of the preferred. This happens nearly every night at my table. I say something like, “we need to try (touch, taste, etc.) all the foods on our plate. I don’t request a specific number of bites or get to specific. This will be different for each kid and you will want to make the demand greater over time as they make progress. My question is about eating until the belly is full and dessert. So if they decide their bellies are full after only a few bites because they are avoiding what they don’t like. Do you then still offer dessert? I struggle with this. I would say no, then dessert is off if they are full and let them know that. I would also consider having dessert a little later or not having dessert every day, maybe it is just a sometimes thing that has nothing to do with how much or what they ate. This can be a gradual change, I know that these changes can be hard! Oh Corrin, I love that! Thank you so much for sharing, I hope it inspires some other parents to work out similar solutions for their own family. Thank you so much Adina! I totally agree with you, serving family is style is such an important tool. I’ve actually written a post completely on that topic, which you can find in the Article Index (in the menu bar at the top). I have a question regarding dessert. My six year old always “saves room for dessert” at dinner time. In the past, I’ve asked her to eat x amount of food before she is allowed dessert. What do you reccomend, as I would like for her to trust her instinct but still eat a proper dinner before dessert. It can be really tricky to go backwards on this. I would start to make desserts smaller or better yet healthier. Maybe a baked apple with some oats and honey? Maybe some fresh fruit? Have her be part of the process and you could even tell her that the cookies/candy/cake/ice cream are just “sometimes” food. I would also start to talk to her about how you want her to eat her dinner until she feels full and then later you can have dessert when she’s hungry. Let her know she doesn’t need to save room. I would focus on this being a process, not something you need to change drastically. Our house rule: No screens at the table. No phones. No laptops. TVs and iPods go off. In fact, no toys of any kind. This goes for mom and dad too. Sharing food is one of the ways the human animal bonds with others. I expect everyone at the table to be present. “It is our child’s job to decide how much they eat”- well, I’ve got the opposite problem. My 20 month old boy has a massive appetite, eats sometimes more than. He is allergic to milk and dairy, soya, tomatoes, coco, still breastfeed. Because of allergies I would say our diet is extremely healthy, no processed or junk food, no sweets etc, a lot of veggies, fruit, fish and grains. So we’re not talking chips and ice cream here. Is it possible to a kid at this age to eat to much of the good stuff? He used to be a very skinny baby on the bottom of scale, now he’s well build, but not fat in my opinion. Our pedi says he gained to much and I should restrict the amounts of food. But that doesn’t seem right to me, he’s always in motion, grows so fast and he does eat only healthy stuff. Can a kid have to much millet or broccoli? We are really getting into personal opinions here and I obviously don’t know that much about your child, but I think it is an incredibly rare situation to limit children’s food at this age if they are eating healthy. However, if he just eats all day long that isn’t a good thing either. I would try to make sure he is on a schedule and doesn’t have anything but water in between his meals. I wonder if my son has a sensory issue – not against food, but FOR it. When he’s in an overly stimulating situation he has always, since infancy, wanted to eat until he spills over. He remains a dedicated thumb-sucker and it can calm him instantly. I wonder if his internal senses become blunted by stress and so he seeks food stim. I get terrible looks when I deny food or water to a crying toddler, let me tell you! But I try to manage the stress rather than let him eat himself sick. Yes, that is entirely possible! I don’t know how old he is, but give him something appropriate to chew on- vibrating teethers, toothbrush, or gum. We use a “no thank you bite” at our table so my daughter needs to take at least 1 bite of everything before saying “no thank you”. We have always eaten all of our meals at the table and she picks out what she wants for dinner at least 1 night a week when we go shopping and she helps prepare it. She has never been a problem eater and loves to try new things and pick out new things at the store. When she is finished, she has to ask to be excused. If she isn’t hungry, I don’t force her to eat but I do save her plate for when she is hungry and she usually will eat everything when she is ready. Interesting post. Our rules are staying seated (no hopping up & down, standing on chairs, running around the table swapping chairs), no toys & your number 2 – if you eat all your dinner you get a treat/dessert. We also just started number 9. We really struggle with number 4 & 6. He eats so much his grazing is more like full on meals! He eats super healthy too, just limited types of food, so I’m not sure if I should rock the boat too much just to get him to eat more variety. It’s tough! It is definitely a personal decision. I respect any parents decision to do what works in their home. If things start to go south though, you have these strategies to put in place. She’s also shaking every morning. She’s a terrible sleeper so I hate to wake her but since she’s shaking almost every a.m. maybe I should wake her a few hours earlier so feed her? I’m seeing her pedi this week too but any ideas are helpful. I would definitely talk to her doctor about this, but I would probably not wake her. Maybe she needs something right before bed, the doctor or nutritionist should be able to recommend so that her sugar intake is where it needs to be. Oh my gosh! I am so happy to find this blog. I’m going to go through and read everything. But I have to ask, in case I don’t find anything on my specific question, because I am so desperate for an answer. I was just thinking I might need to call a nutritionist. We were vegan for a couple months, now vegetarian, but perhaps we’ll be omnivores I don’t know what to do with my toddler. I have a very hard time getting her to eat protein. She’s 2 and has recently shown that she has hypoglycemia and I can’t get her to eat! She wants to snack on crackers all day so I’m trying to keep her to specific meal times that are 3 hours apart hoping she’d be hungry and eat. She will not try new foods. She has to see them many times before she’ll eat them. I’m guilty of shoving cotton candy in her mouth to get her to try it. Normally I won’t do this, never had before and haven’t since. It’s just an example. She ended up loving the cotton candy. But this is what happens, she won’t eat anything but carbs and then she’s shaking and I’m giving her anything she’ll eat, which is usually a starchy or sugary food. I have recipes for slipping in veggies but I need ideas on slipping in protein. I have protein powder but it’s a bit grainy and she has rejected my previous attempts with it. Cheese, almost always no, ‘chicken’ nuggets usually yes, yogurt, sometimes, beans never, nuts no way. Smoothies yes as long as no protein powder. 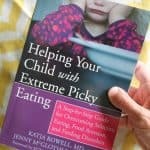 So seriously what to do with a picky eater that’s also a hypoglycemic? She’ll eat a certain food for a little while and then change her mind and it takes me weeks to find a new food she’ll consistently eat…until she changes her mind again. Thank you so much! Protein can be tricky for kids. I would really work on cheese and bean dips with her for her crackers. It won’t be easy, but the repetition would be helpful. See my post: Exploring New Foods in the Article Index, which is in the menu bar, that will give you some ideas to get her trying new foods. I also have a post, Getting Your Kid to Eat Meat- you can apply some of the same principles to other protein sources. Try not to give her the same foods every day, because she will burn out on them. I would highly recommend looking into a feeding therapist, which is usually an OT like myself or a SLP. There is no pressure but I also offer private consultations, if you think that would be helpful. We are currently using #5. We are struggling with our 4 year old. Often after 1 mouthful she states that she is full. She is having a small piece of fruit for afternoon tea. If we try to get her to eat more, it usually ends in frustrating for everyone. Any advice? Should we just leave it and hope she starts eating more dinner? It is really important that she have at least one food that she usually eats, if she does then have peace of mind. 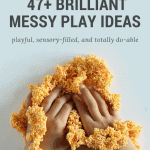 See the post Exploring New Foods in the article index (menu bar) under picky eaters for more ideas on how to get her eating new foods. You definitely want to avoid a power struggle and the “just take a another bite” route. I came across your site recently and have read every post on “picky eaters.” Thank you so much for sharing… I’m feeling enlightened and overwhelmed all at the same time! My 5 year-old son is extremely picky – may even possibly fall into the “problem eater” category. Everyone is always giving me advice. No one seems to understand the extent of the issue. They either brush it off and say “he’ll grow out of it” or they say I need to be more strict and just let him go hungry if he won’t eat the meals I fix. I feel like I have a good plan in place and have been working on our eating routine, eliminating unnecessary snacking, and spacing meals closer together. My biggest stress as I’m trying this is wondering what to do if he refuses to eat his dinner? Tell him he won’t eat again until breakfast? I feel awful sending him to bed with a grumbling tummy! At the same time, I know if I give in and let him eat something different, it sets a precedent for future nights… Help, please! I know that sounds like tough love, but it is completely fair as long as you have at least one food for dinner that he normally eats. If you normally have a bedtime snack than he can wait until then, but if you don’t it is fine to tell him to wait until breakfast. He probably isn’t experiencing hunger the same way as adults do, if that helps ease your conscience at all. I had most of these when my kids were growing up and we never had food issues. Another one I had was everyone could have one food they did not like and didn’t have to eat. They could make themselves a sandwich or bowl of cereal to eat instead. I wouldn’t make anything special for them. We all have foods we really don’t like and as long as they had previously tried it, I gave them this out. One of mine hated barley because of the texture, another one didn’t like fish. I for one gagged on milk when I was growing up. My body can’t tolerate it now and 3 out of 4 of my kids are allergic to it. I think my body was trying to tell me something. Mine are all grown now and all eat a healthy diet. I just read Child of Mine by Ellyn Satter and it was such a fantastic resource to read. Went immediately to read her other stuff. 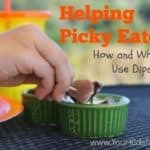 I have a picky eater and so far in the few days we’ve been following those principles (same ones you mention here, it seems) it has been a huge load off my mind about whether she eats. And it’s helping ME in that I don’t feel the need to graze along with her and instead be more intuitive about what I eat at meals and snacktime. This was so helpful. Thank you. We have an almost 14 month old. I didn’t even think of some of these things, just was naturally doing them, and I’m glad I read this so i can re-think strategy and promoting good eating before there is a problem. Love prevention. I grew up in a family of 8 kids. We had to eat everything on our plates. I’m 32 now and overweight. I know I STILL really struggle with leaving anything on my plate because of that family rule. YIKES! What do you do when you live with picky adults? My husband and I aren’t picky eaters and love trying new foods. Our daughter is, so far, the same way. We live with my brother, who isn’t very picky at all, but legitimately doesn’t care for some of the foods we make, which is understandable and on those nights, he happily makes his own dinner or goes out, so as not to inconvenience us. We also live with my father who is, by far, the pickiest eater I’ve ever met. He refuses to eat the vast majority of things we like, claiming it’s too weird. And this isn’t exotic or ethnic foods he’s refusing. He won’t eat spinach or broccoli or any of the healthy food we keep on hand to snack on. I’m constantly having to make two meals because of this and I don’t want his behavior to influence my daughter’s eating habits. He lives with us because he is elderly and disabled and we take care of him, but I’m at my wits end. Oh Margaret, I feel for you, this is such a tricky situation. Is it possible for you to have a talk with your Dad about how you respect his choices but are concerned that the negative talk may affect your daughter? I’m hoping if you approach him at a time when you aren’t particularly frustrated he may get it a little. It may also be helpful to talk to your daughter if she starts to question some of this things he says and does. I would keep it very positive and explain that her grand-dad doesn’t understand a lot about food but that you are trying to be respectful. Let he know how happy it makes you that she eats so well and how proud she should be of herself for taking care of her body with nutritious food. It is normal for kids to go through some phases, it is important to keep presenting and try food in different ways to keep him interested. Try to build off the proteins he is eating by making small changes to what he already likes. My step daughter is not a picky eater as much as a selective eater…meaning, she will eat it one day and the next hate it and the next ask for it again…when she doesn’t want to eat what we serve (as I already plan meals around when they are going to be there and what they like) I make her a plate, I give her already what I know for sure she can finish, usually not enough to fill her up for her age/size and until she finishes that she can have nothing else. I will let her get up from the table when she says she is done and leave her plate. I think f you aren’t careful with the rules kids like my stepdaughter learn that if you don’t want what we are having say you don’t like it and you can have candy and junk food instead. I totally agree, that kids will learn to manipulate quickly. That is why one of my cardinal rules is always have one preferred food and secondly no food in between meals. I make it clear to my kids when they get down that there is no more food until the next meal 2.5-3 hours later. My sons 14 months old, and very independent. He doesn’t let us feed him anymore which is fine but I’m worried that his not eating enough. He still as up to 8 bottles a day. Two to three of them through the night. He’ll have three to four mouth fulls then it’s all on the floor and the dogs eat it. It sounds like he is getting most of his nutrition through milk still, which leaves him not feeling really hungry. At his age he should be getting around 16oz of milk a day, give or take a little. I would start to modify his schedule first during the day so that he has more of an appetite for meals. My youngest will eat 2 bites of dinner and then asks for a cup of icecream or a different large amount of dessert. What should I do in this situation? Well, I guess you have to decide if you want to make it a rule that if he eats he gets dessert. If you aren’t making that a rule, which I recommend, than I would tell him dessert is a special treat and not something you have every night. If dessert is a ritual try serving fruit or something healthy as an alternative. It sounds like splitting hairs, but there’s a difference between “if you eat, you can have dessert” where you’re rewarding with dessert, and “If you DON’T eat enough healthy foods, you DON’T get dessert” where you’re taking away a privilege for unhealthy choices/not allowing additional unhealthy choices. Even so if dessert is not an expectation, it’s hard to take it away. Eating well for its own sake seems like a better tactic. When my kiddo was 4yo, when I started having a bit more say in parenting choices and convinced her dad to change some rules around, we had to switch my kiddo’s dessert time to afternoon snack–an after lunch dessert instead of an after dinner dessert. We did it because she was having nightmares from sugar crashing, and I’d been planning on the next step of cutting back from it being an every-day expectation, but even just the decision of what time of day dessert was meant she didn’t always get it. Making desserts a treat on a grander scale, like going out to an ice cream parlour as both an adventure and a luxurious food, meant we could use it as a treat for great accomplishments and grand occasions. We would give the child dessert but only in quantities similar to the amount of dinner the child just ate. So, if he only ate four bites of dinner, then only four bites of ice cream. If he complained of being hungry, then he could have fruit or veg, but nothing carbohydrate. I also found that my child was drinking his dinner – we were giving him way too much milk. When we cut back on his milk at dinner, he ate more food and was complaining less of being hungry. He still got plenty of milk and water, but just less at dinner time. Milk quantity at dinner can be a huge culprit of a poor dinner consumption. You can definitely give some, as you said, and then when he is done eating, give him more. This is a great article, I’m so glad I found your site. I do agree with not letting children graze but I do also think it’s important not to confuse that with letting them have snacks. Children (especially young ones) can’t go the long times in between meals that adults can (and they get so grumpy when they’re hungry). Letting them have healthy snacks is good. We have 2 snack times in our day, in the morning and the afternoon. But as you say, we still sit down and eat 3 meals together each day. I think people often equate ‘snack’ with sugary treat, but a snack can be anything. And healthy snacks such as fruit and vegetables can be counted in your ‘7 a day’. Yes, I totally agree about the snacks. I think they should be treated as mini meals! Thanks so much Orlena! Thank you. We still struggle, but the struggle seems so much bigger when I try to do it the way other parents do. (Polite bite, etc.) I need these reminders often. Thanks Katie, I’m sure there are still challenges! I’m so glad this was a reminder and is exactly why I wrote this post, too many parents feel pressure to do what is “working” for other parents. Hang in there! No toys or electronics etc. at the table. Thanks again Alisha – you have been a huge help to my family! Yes, yes, and yes!!!! I almost put those on the list. Mealtime should just be for eating, for everyone. It is really important that adults follow this too. When babies and toddlers are throwing food and plates, I use the mantra, “food stays on the table.” With kids that are a bit older they have to get down immediately and pick it up! Thanks so much for your kind comment and for following along here! Anonymous, thoughts from a teacher, not a foodie; she may be trying to satisfy sensory needs. Maybe give her a bumps cushion to sit on, to a textured fork. You may find she is a kid that needs to stand in school. Seeking sensory stimulation actually helps some people focus better. To the 51/2 year old starving 10 min after meal time. Keep her plate ready to go , so when she comes looking for a snack, she is only offered the same supper until it is finally gone. 😉 works for us. Yeah just… don’t do that with cereal, okay? It’s one thing to say, “If you won’t drink the milk/eat it all, you can’t have any at all” and something else entirely to force your child to eat soggy cereal and stale milk four meals in a row until they choke it down and get sick and never eat cereal again. Learn from my parents’ fail! I’d much rather never eat cereal because I was just never fed it as a kid than gag at the smell of it. Thanks for this. I have 19 month old toddlers, one of whom is extremely picky, and I confess I’m guilty of #4 too often. I have a question about #6. I always make separate meals for my kids because I eat an extremely restricted diet. I have digestive issues (and let’s be honest, an unhealthy relationship with food), so my palate consists of fish, potatoes, corn, tomatoes, berries, and leafy greens. That’s pretty much all I eat and I will happily eat the same thing day after day. My question is, should I be serving the kids the same thing I’m eating, even when it’s so restrictive? Or is it better to serve them a variety of foods even if they don’t see me eating them myself? It is tricky to navigate health constraints around food, I’ve actually had to do this myself. I would suggest still giving them a variety of foods even if you aren’t eating them and when ever you are able to fake it. Try to at least put a piece on your plate and move towards everyone eating the same thing as a first step. Good luck!